The classical guitar is known as concert guitar, nylon-string guitar and Spanish guitar. It is used for playing the classical music. It has an acoustical wooden sound box with strings made of nylon as opposed to the metal strings used in acoustic and electric guitars. There are three things that separate classical guitar also called Spanish guitar, or classical guitar from other styles of guitar, the playing technique and the classical music. 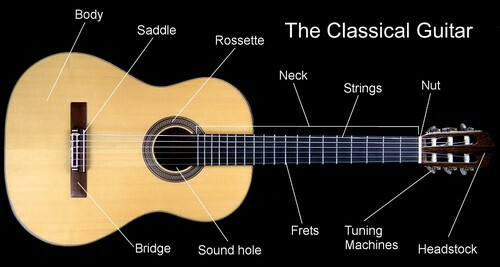 The strings are made of nylon - classical guitar strings are generally made from nylon which produces a rich, warm sound. The fret-board is slightly wider - classical guitar fret-board is built slightly wider than on most guitars to make it easier to play complicated finger techniques. The neck is slightly shorter - the neck of a classical guitar is slightly shorter because it makes playing easier. The body is hollow - classical guitar always has a hollow body, which allows it to produce a rich, resonant sound even without amplification. There is a "rosette" around the sound hole - On a classical guitar you will always find a beautiful, decorative design called a "rosette" around the sound hole. This has no functional purpose just aesthetic. Plucking the strings with the fingers - a classical tutor / guitarist plucks the strings with the thumb, index, middle, and ring fingers. This is often called "finger style" technique. Note that a classical tutor / guitarist does not use a guitar pick. Using fingernails to play - a classical tutor / guitarist usually plays with finger nails in order to produce a loud, clean and resonant sound. Playing with a natural "acoustic" sound - classical tutor / guitarists usually play with a natural "acoustic" sound, which means they do not use any amplification. Sometimes the guitar is amplified with a microphone. Holding the guitar in place with a support - A classical tutor / guitarist uses a guitar’s support to hold the guitar in a good playing position. There are many different types of supports that a guitarist might use, such as a foot stool, a strap and an attachable support. Playing "clean" - classical tutor / guitarist usually plays without making any buzzing sounds, nails noise and missed notes. This is called playing "clean". Producing a warm, rich tone - Usually, a classical tutor / guitarist tries to produce a warm, rich and mellow tone when playing. This may vary from classical guitarist to guitarist. The classical tutors / guitarists only play music from one genre, called classical music. It is a musical style that comes from the European liturgical music and secular music traditions. You probably heard of some of these most famous classical musicians such as Beethoven, Mozart Bach and Brahms. The music is written in staff notation - Composers always write classical music in staff music notation. This is the most important thing that separates classical music from other genres. The music is played exactly "as written" - classical music is performed exactly the way it is written in the staff music. In other words, there is very little improvising, altering and adding to the piece by the classical tutor / performer. Music ranges from Renaissance to Contemporary - classical music spans a wide time frame, from about 1400 C.E to the modern era. This includes many important musical eras, such as Renaissance, Baroque, Classical, Romantic and more. Music from different cultures - unlike other musical genres which primarily come from one specific culture, classical music comes from different cultures. For instance, you can find classical guitar music from Spain, Cuba, Brazil, Italy, England, Germany, Japan and Singapore. Music incorporates different styles - from long history and the various cultural influences, classical music incorporates a wide range of musical styles. For instance, classical music has incorporated elements of jazz, pop, impressionism and others. Guitar Lessons Fees guide. We reserved the rights to change at any time. To engage a private Guitar tutor, please submit the "Request-Tutor-Form" or Call us : Mobile: 9385-5548 for Assistance. We also accept voicemail, texts, What'sApp, if you want us to call you. We will find a suitable private Guitar tutor for you, as per your Request-Form. Feel free to browse the links on this site for more information.